On Saturday, a 4-year-old child got away from his parents and crawled over a barrier. Sadly, he tumbled 20 feet and was killed. This was reported on page 20 of the local news and buried on a few local websites, but nowhere else. The parents blamed the people responsible for the barrier and filed suit, while the other party insisted they were not to blame. Those few who read the news reports sighed about the tragic accident, and moved on with their lives. No one called the mother negligent or horrible; no one picketed the other party. We know so little about this story that I’m not even sure it happened. Probably something like this did somewhere in the civilized world, but we don’t know about it because no one paid attention — we all know of similar stories from the past, even the recent past. From which we learn that society now cares more about the life of a gorilla than the life of a young boy. Because something quite similar to the above did happen on Saturday, but the boy wasn’t actually harmed, at least not seriously. He fell, however, into the gorilla enclosure at the Cincinnati Zoo. One of the gorillas, called Harambe, came over to him and initially seemed to care for the child, but then grew agitated and dragged him away from people. After several minutes trying unsuccessfully to calm Harambe, the animal care team realized the child was in imminent danger, and shot the gorilla. “Animal rights activists” held a vigil at the Cincinnati Zoo. Never, in the 143 years since the Cincinnati Zoo opened, has anyone previously entered an animal enclosure — and most zookeepers are reluctant to shoot the animals under their care. But they are taking the zoo to task, claiming, of course, “excessive force” — that it should have been possible to retrieve the child unharmed from an agitated 450 pound gorilla if they had simply asked nicely enough. 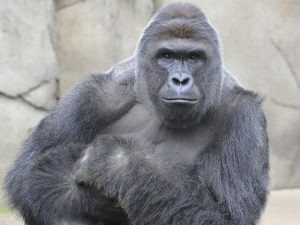 A different school of thought launched a petition at change.org calling for “the parents to be held accountable for the lack of supervision and negligence that caused Harambe to lose his life.” The undersigned even “actively encourage an investigation of the child’s home environment in the interests of protecting the child and his siblings from further incidents!” And this petition crossed the 400,000 signature mark during the time this post was written. Not only are newspapers displaying the names and the pictures of the boy’s parents, Deonne Dickerson and Michelle Gregg, but they are discussing the father’s “criminal history” as if this were somehow relevant. Those of us who have actually been parents should know how ridiculous this all is. Michelle and Deonne have four children, the littlest of whom was not delighted to learn that mommy thought it was time to leave the zoo. During the moments that it took to attempt to mollify her, the four-year-old dove for the barrier — and, yes, a four-year-old is going to find his way past reasonable barriers if he puts his young mind to it. Anyone who thinks this requires parental negligence has never parented. Or, it is as my own young son suggested: people are holding vigils and signing this petition because they know the gorilla was more intelligent than they are. 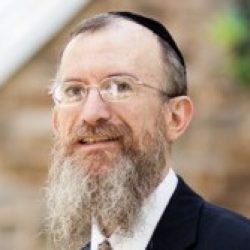 Chazal tell us that when Migdal Bavel, the Towel of Babel was under construction, the people cried if a brick fell and broke, but they didn’t cry if a person fell and was killed. It seems beyond illogical. If nothing else, a person is able to make and carry more bricks, so why wasn’t the death of a person at least as important as the brick? But here it is: hundreds of thousands of people, none of whom would have blamed the mother of a child who escaped her attention and fell to his death, are calling for Gregg to be held responsible because her child’s fall led to the death of a gorilla. The entire Western ideal of care for animals, of course, comes from our Torah. But once taken outside of a Torah context, that same principle can be horribly misused. We know that a human life is of infinitely greater value than an animal life — and fortunately the staff of the Cincinnati Zoo does as well. Not so, apparently, hundreds of thousands of people in the United States and elsewhere.